In fact, as my colleague recently brought to our attention, more emails are still sent every minute than the number of Facebook logins, Snapchat videos, Tinder swipes, Tweets and a dozen other platforms combined. While Facebook Shares, viral retweets and Hacker News front page mentions are all cool, sending targeted, personalized emails continues to be the best customer engagement tool and lead generation strategy. However, creating targeted, personalized email is not easy. Building an end-to-end, automated pipeline requires engineering help (which you don’t get): In case creating a segmented email list once isn’t challenging enough, consider automating the process to run on a hourly/daily/weekly basis. This requires a decent amount of engineering work, that likely no engineer will volunteer to help you with. Most likely, you’ll end up with a janky workflow that breaks frequently, making you wonder if it’s better if you run it manually every week. 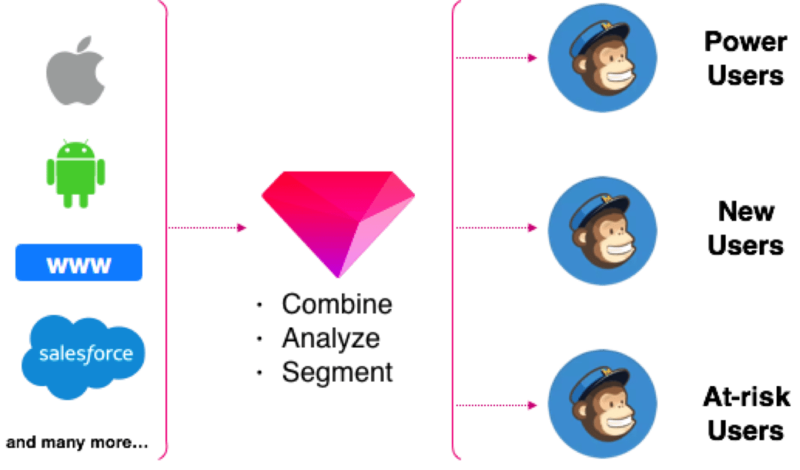 The Mailchimp Output integration is Treasure Data’s answer to solve these problems. The rest of the blog post will give you an overview and directions on how to build personalized email lists on Mailchimp in an automated manner. 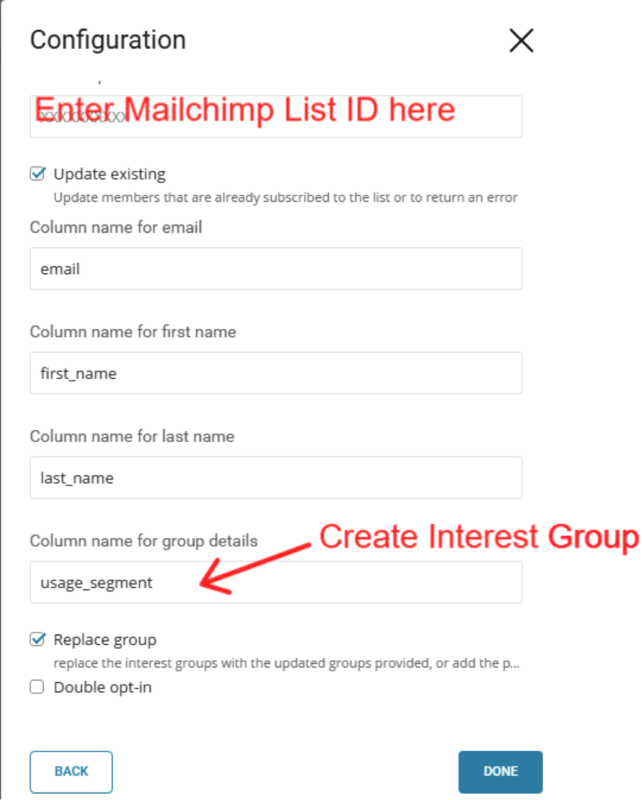 The Mailchimp Output feature lets the user create or update a Mailchimp list based on a Treasure Data query result. The query result must have at least three fields: email, first name and last name. Optionally, you can add columns that represent different “interest groups”, the Mailchimp feature that allows the user to segment a list based on the recipient’s interests. Setup is simple: Once you are done writing the query on Treasure Data, select Mailchimp as the output destination. During your configuration, you are asked for a Mailchimp API key as well as the ID (not the descriptive name) of the Mailchimp list you wish to replace or update. See our documentation for how to look these up. Now that we know how this feature works, let’s see a couple of examples. If you are running a SaaS business, product usage data is one of the most obvious and powerful data points you can use to personalize your customer communication. The final step is configuring the Mailchimp output inside Treasure Data Console. Make sure that the “usage_segment” column is picked up to populate an Interest Group on Mailchimp. Once Mailchimp’s output is configured, it’s time to run the query and see your Mailchimp list created/updated. Note that this process can be automated via Treasure Data’s scheduling and workflow features. If you are a data-driven marketer or product manager who’s always wanted to send better emails via Mailchimp, you should request our product demo today. If you are an existing customer of Treasure Data and Mailchimp, we’d love to hear how you are combining (or not) the two products today!